Nobody concerns himself overmuch with the United Kingdom’s birth rate, and its portents for the economic and geopolitical destiny of that land. Well, some actually do, but said concern is of the Eurabia, not the Children of Men, variety. In contrast, the image of Russia formed after the collapse of the Soviet Union was one of a desolate wasteland where women voted with their wombs against its continued existence. This might have once had some elements of truth to it, but surely this view is increasingly fantastic now that Russia’s crude birth rate, at 13.2/1,000 in 2013 – and slated to rise even higher this year – is the highest bar none in Europe. It is also, as of 2012, higher than that of the US. The only developed countries where birth rates remain higher than Russia’s are Australia, New Zealand, and Iceland. 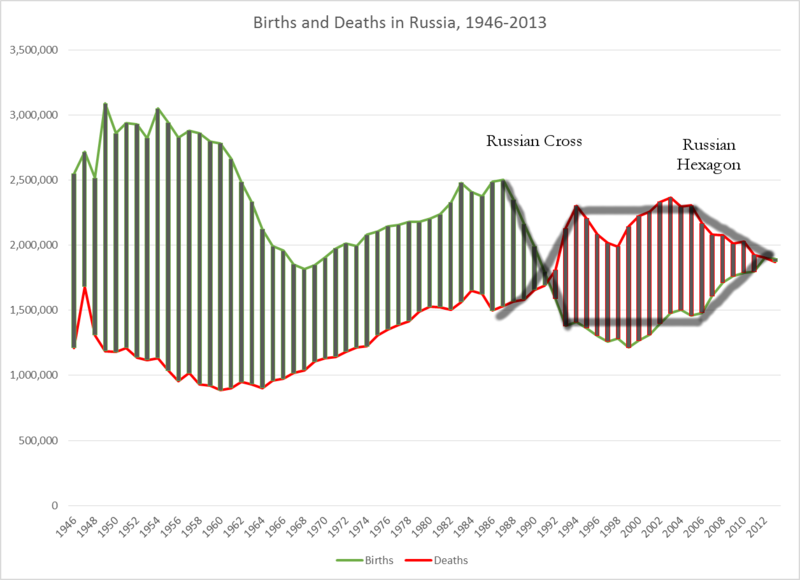 A major cause of this is that Russia still has a relatively high number of women in their childbearing years, even though this indicator began to drop precipitously from around 2010, when the effects of the post-Soviet fertility collapse started making themselves felt. This is an inescapable structural legacy that will be making itself felt in the form of downwards pressure on crude birth rates until well into the 2030s. This is where a concept known as the Total Fertility Rate (TFR) comes in. The TFR measures the expected number of children a woman will bear in her lifetime, and is calculated by summing up age-specific fertility rates in a single year. Its advantage is that it is independent of the population’s age structure. After plunging to a low of 1.16 children per woman in 1999 – a “lowest-low” fertility rate that was once theorized by some demographers to be irreversible – it has since climbed to 1.71 in 2013, and on the trends observed this year until August, will rise further to the mid-to-high 1.7s in 2014. 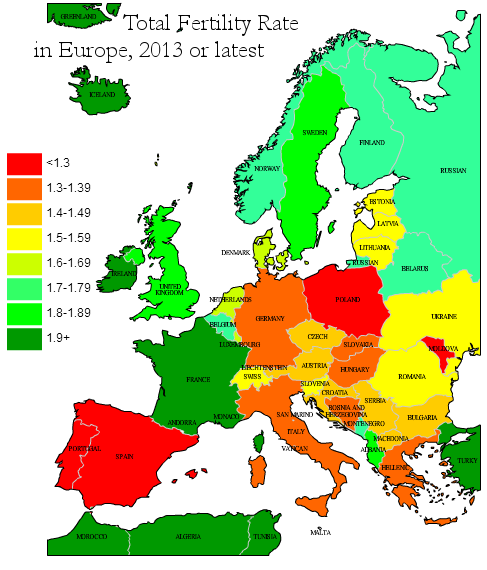 This map shows European TFRs as of 2013 (or 2012 in a few cases). In the late Soviet years, Russia was deep green, but plunged into the red and deep orange during the dislocations of the transition years. But it has now regained a greenish hue. A normal country, quite similar in its TFR to Finland or the Netherlands – countries not particularly known for being in a deep demographic abyss. And considerably better than the Christian Mediterranean, the Balkans, the Baltics, the Germanic lands, and East-Central Europe. It is, in fact, remarkable that the two countries considered to be Europe’s most politically “regressive” by the Brussels-Atlanticist elites – that is, Russia and Belarus – have come to possess Eastern Europe’s best TFR indicators, while star reformers such as Poland and the Balts wallow in the demographic doldrums. This must be a bitter pill to swallow for the ideologues who claimed demographic decline is a natural consequence of Putinism. Or it would be, if they ever bothered descending from their pulpits to look at actual statistics, but they don’t. 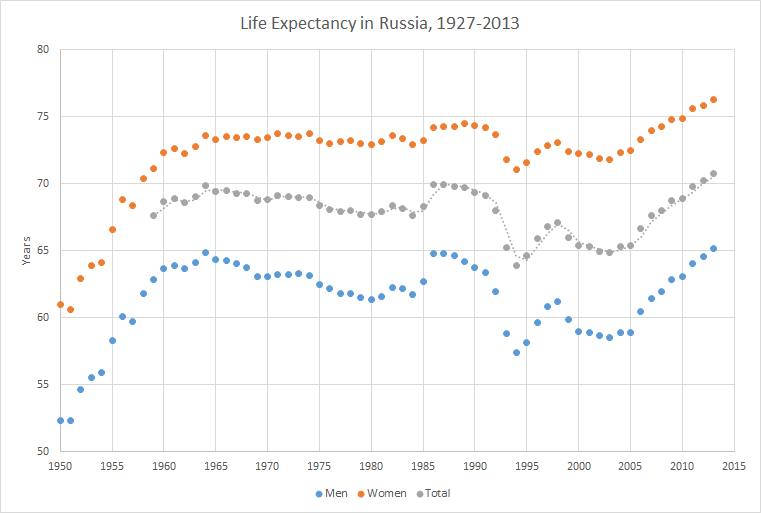 Russia performs much more poorly on measures of mortality and life expectancy. This has its roots not in Putin’s age, nor even in the Soviet collapse, but in the alcoholism epidemic that began to spread throughout the Soviet Union from the 1960s. This is when life expectancy, previously rising fast, hit a plateau at close to 70 years and then stagnated indefinitely with the occasional peak (e.g. Gorbachev’s anti-alcohol campaign) and trough (the mid-1990s). In the early 2000s, it was estimated that excessive drinking – which in Russia takes the form of concentrated vodka (if not moonshine or other substitutes) binges, as opposed to the moderate daily wine drinking characteristic of Mediterranean countries that on paper drink abou as much as Russia – accounted for 32% of aggregate mortality (including 23% of CVDs, 42% of suicides, and 72% of homicides). In comparison, this figure was just 4% in Finland, by far the most “alcoholized”of the old EU countries. But thanks to increasing wealth, changing cultural mores, increasing state taxes on alcohol, and advertising restrictions, the prevalence of bingeing has been going down for the past decade. 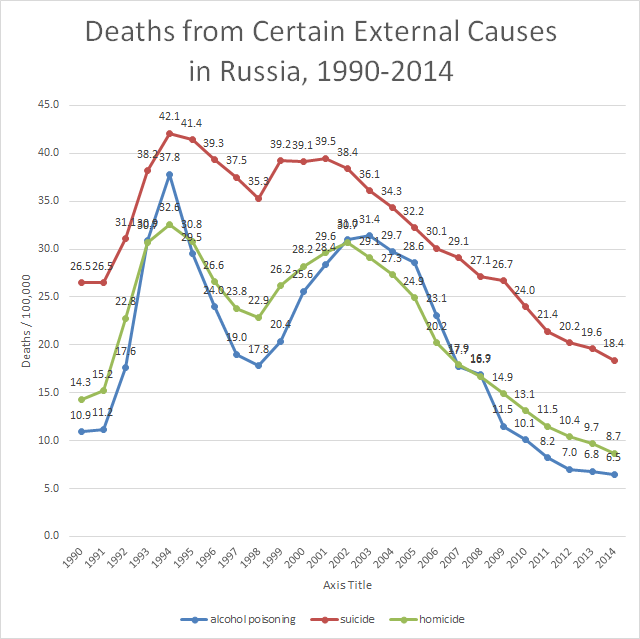 This trend is directly reflected in the mortality rate from alcohol poisoning, which peaked around 2003 and has since plummeted to levels significantly lower than even in 1990, when Gorbachev’s anti-alcohol campaign was still active. Suicide rates and homicide rates are also vastly down, in the process making a mockery of a large part of Michael McFaul’s academic career (he wrote a huge and hugely influential Foreign Policy article arguing that public health declined in Putin relative to Yeltsin’s time). Overall mortality too has declined significantly, from a peak of 16.4/1,000 in 2003 to 13.0 in 2013, despite the continued ageing of the population. This resulted in very considerable growth in the life expectancy. After hovering around 65 years from the early 1990s to the mid-2000s, it started rising quickly and broke the symbolic 70 year barrier for the first time in Russian history. This positive trend continued, with the 71 year mark likely to be passed this year. There is still a long way to go, of course. The Baltic states and Hungary, where alcoholism was also somewhat of an epidemic during the Communist period, have a life expectancy of 75 years (though it was more like 70 years, i.e. Russia’s today, some 5-10 years ago). In traditionally more sober – at least as regards vodka bingeing at any rate – Poland and the Czech Republic, it is 77-78 years. In Finland, a country that shares Russia’s traditional drinking culture, but avoided its Communist experience and from the 1970s acquired access to high-end healthcare, it is 81 years. But the progress that has been made in the past decade has been very considerable and is in considerable part attributable to the policies of the Russian government under Putin. Perhaps the one concerning recent trend is in the migration sphere. Are Russians, or at least the Echo of Moscow liberal types – after the “sixth wave of emigration” loudly trumpeted three years back, and ruthlessly exposed on this blog – finally making good on their promise of “pora valit” (“it’s time to leave”)? Upon a closer examination of the migration stats, it’s clear that the answer to that question is in the negative. By far the biggest portion of the recent increase in emigration accrued to member states of the CIS; rest assured that people are not going from Russia to Uzbekistan, Tajikistan, or Kyrgyzstan in search of a better life. Moreover, the emigration increase was largely matched with an increase in immigration from those countries. This suggests a bureacratic as opposed to a “real” change, e.g. better border surveillance, or a change in the reporting procedures. While there was a significant increase in emigration to the Far Abroad, its overall scale remains virtually insignificant both relative to population flows between Russia and its Near Abroad, and to Russian emigration to to the West in the 1990s. None of the cataclysms predicted for Russia in the days when a “dying bear” article was getting published every other week have come to pass. There is no sub-Saharan African level AIDS epidemic. The Chinese have yet to take over Siberia, and the Muslims have yet to take over the Russian Army. The population hasn’t plumetted to 130-135 million, as many demographic models were predicting for 2015 just a few years ago; to the contrary, even discounting Crimea’s return to the fold, Russia’s population has decisively broken its post-Soviet pattern of decline, and is now back to 144 million and is slowly but steadily growing. Russia’s demographic trajectory in the years since I started this blog and created my own demographic models has exceeded even my most optimistic predictions. There is no more point in talking about Russia’s (non-existent) demographic crisis or really in paying undue attention to it, except perhaps insofar as it could provide lessons to other countries on how to escape from a demographic rut (in particular, a strong argument can be made that maternal capital can have real efficacy, in contrast to the conventional demographic wisdom of ten years’ yore). In short: The bear is not dead. Long live the bear! The real puzzle now, if anything, is explaining how a negative Russia trope could sustain itself so long in the Western press – a Washington Post op-ed from this very month is still, risibly, talking about Russia’s “demographic decline” – long after whatever factual underpinnings it might have once had have crumbled away. It’s amazing how pundits get away with elementary mistakes like this in a press environment that at least pretends to be free, professional, and adversarial (unlike those lying goons at RT).